Wikis are the new websites of the internet hosted by wikifarms using wikitext instead of HTML. Two examples of wikis are Wikipedia and this very wiki. Wikis are focused around community and collaboration. Vodafone can capitalise on the need for improved communication between collaborators and mobile editing. With its rising popularity, wikis will continue to expand and develop to better serve the needs of its online communities. Back when the world wide web first started, Hypertext Mark up Language (HTML) was used as the language to create webpages. HTML was extremely flexible giving the ability to show and display page in any way you like. However, it required the user to invest time and energy into studying HTML coding. It was also hard to see what the code would actually show the user. Realising that this was not the best way to introduce people to building websites, the concept of a 'wiki' was created. Instead of HTML, Wikis use a simplified code known as wikitext or it uses a 'What You See Is What You Get' (WYSIWYG) editor. This makes editing easy. Editing can be done straight from an internet browser. Users can create and link wiki pages together. Previous changes are stored and can be restored. Users can search within the wiki easily. Different levels of access can be granted. An administrator can make all the changes while a member might only be able to edit certain pages. You can track pages and changes taking place on them. Just like you need a website host when you want to get a website, you need to look for a wiki provider to get a wiki. Wiki providers are called wikifarms. Most rely on advertising to provide free wikis while others rely on paid subscriptions. Wetpaint - One of the biggest and listed in Time Magazine's 50 Best Websites (of) 2007. It is supported by Google Ads. Wikidot - An up and coming wikifarm and the current wikifarm hosting this report. Peanut Butter Wiki - One of the largest personal wikis. Offers free and commercial wikis. Wikia - A wikifarm providing free wikis organised around online communities. Wikitext is the language used to tell the wiki what to show when someone visits. Unlike HTML, there is currently no standard wikitext language. Different wikifarms will have different wikitext to do exactly the same thing. As an example, let's take a look at creating the following paragraphs in HTML and in Wikidot's wikitext. This is an example sentence and this word links to google. This is another example sentence and this word links to hotmail. This is an example sentence and [*http://www.google.com this] word links to google. This is another example sentence and [*http://www.hotmail.com this] word links to hotmail. As you can see, wikitext is much simplier. Here are some articles explaining how wikis work and their usefulness. How Stuff Works - A very good article on what wikis are and how they work. 7 Things you should know - Explanation on wikis and its uses. ZDnet - Video explaining wikis. Wikipedia - On various wiki farms. Let's take a look and compare two wikis. 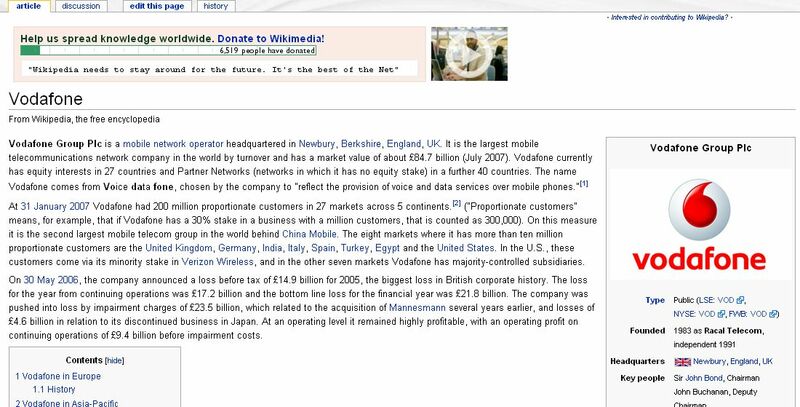 First will be Wikipedia, the online encyclopaedia and the next will be this wiki, the Vodafone Ihug Internet Explorer wiki hosted by Wikidot. Wikipedia is the most famous and possibly the biggest wiki online. The goal of Wikipedia is to create an free online encyclopaedia. It is currently ranked as one of the top 10 websites visited globally. Allows anyone to create or edit a page. Has several levels of users. For example, the lowest level of users can create or modify pages but remains anonymous while administrators can perform more advanced actions such as locking articles or blocking users. Administrators are granted access by community consensus. Requires users to follow the rules when contributing. Article - The main article. Special Topic - Discussions about the article. Edit this page - Where you can edit the page. History - Where you can take a look at older versions of the page and compare differences. By allowing everyone including anonymous users to edit, there has been concern over the reliability of Wikipedia. While it is true that Wikipedia is subject to vandalism from time to time, it has a very active community. Since users can track pages, someone will very quickly notice the vandalism and will correct it shortly. Considering the English version of Wikipedia has over 2 million articles vandalism does occur but is contained by the community. Another point of contention is the credibility of Wikipedia as it is a free resource which anyone can edit. Critics argue that as articles can be written by anyone, there is no way to ensure what is written meets a reasonable standard. There however, are a system of checks and balances that hold Wikipedia together. The first of these checks are the guidelines. These are the standard guidelines that all users must abide by when creating or changing an article. Just as importantly, there is a system of open peer-review. Users can build up credibility within the community and articles by submitting to credible editors to be checked, reviewed and commented. This system creates an incentive to not only register under a login so your contributions can be noted, but also to create quality work so it can be viewed by all. Again, it is the community of volunteers that monitor and ensure these are followed. The Vodafone Ihug Internet Explorer wiki is hosted by Wikidot which is a wikifarm which provides free wikis. Allows you to create a wiki on anything as long as it falls within the policy guidelines. Allows the site administrator to make the site private or public and grant different levels of access. Allows site administrators to customise the appearance of the wiki however they like. Has a high level of webpage customisability and flexibility. Edit - To change or update the page. Tag - Tags are keywords to make it easier for search engines to pick up the page. History - To look at previous edits and compare the versions. Files - To attach files. Print - For a printer friendly version. Site Tools - Useful site tools. Options - Other page options. Here are a couple of examples of popular wikis. Wikipedia - Article on Paul Donovan. Wikia - Wiki for World of Warcraft. Wikis were original conceived as a useful tool for collaboration and have been successfully used in scientific and business circles. The success of Wikipedia has made term 'wiki' familiar to many people. Wikis have grown to become important tools for both businesses and everyday users. Although wikis are an exciting development, keep in mind wikis are websites and not everyone needs a website. For people or groups who do need a website however, wikis offer greater accessibility and convenience than a normal website. Due to the success of Wikipedia, wikis will most likely grow in demand. In general, free wikis are advertisement driven similar to free website providers such as Geocities. Very often free wikis also feature a paid option that provides more control over wikis. For example, Wikispaces has a paid option providing users more flexibility in their wiki. There are a few exceptions such as Wikidot. Currently you can upload and post blog entries straight from your mobile phone. With a wiki you can create pages, modify and link to them easily. Vodafone can provide access from a mobile to edit new pages or create new ones. Companies such as Nubiq have websites like Zinadoo which allow users to create their own websites. These websites are similar to New Zealand Vodafone's Self Central except rather than just a social networking profile, users can create their own mobile phone website. The idea of having a website can be extended out to having a wiki and users can invite their friends to participate in their mobile phone website. One thing to take note of, just as internet websites need optimising to fit a mobile phone screen, wikis and wiki functions also have to be optimised to fit the mobile phone screen. Combined with RSS and the inherent collaborative nature of wikis, being notified and being to instantly, track and identify the changes being made becomes an important part of running a wiki. In the same way that you can blog or receive news updates via mobile Vodafone can configure a mobile phone to receive wiki website updates via your mobile. A wikifarm stores information about members and administrators of a specific wiki. Vodafone could provide a service where you could store a list of members in your address book and consult with the person that made the change. An internet company such as ihug provides 30MB of free web hosting as part of a subscription. With movement into a complete telecommunications package, Vodafone could provide an integrated communications package for businesses which includes cheap access to ihug hosted domains and even wiki access as a premium. Wikihow is a website focused on providing free 'how to' wikis and continues to grow in popularity. Vodafone could sponsor a similar site which can provide reviews for mobile phones which could also be a good site to receive feedback on its products to make sure it is doing well. A more in-depth coverage of how social network profiles, RSS, wikis and previous topics can be used as a collaborative tool in a business context will be covered in the special intranet topic. How useful is a wiki to people? As simple and exciting a wiki is to set up, wikis are focused around community. A social networking profile, which is also a kind of website, can be seen and marketed as an online extension of someone's real life. One social networking profile corresponds to one person. A wiki is a community collaboration so not everyone needs their own wiki. This is important when considering the user base. How popular and needed are mobile phone websites and website editing from your mobile phone? As interesting as the concept is, are mobile phone websites and wikis something that people want or is it just a phase? Similar, will editing wikis or websites from a mobile phone catch on? While it may be alright if you're posting on a blog, the screen limitations on a mobile phone may mean it simply isn't useful to have such a service when you want to edit something like a wiki. What will be the wikitext standard? The lack of standardisation of wikitext is probably one of the major obstacles to be overcome in the future. In the same way that HTML has a standard, there will most likely be discussion on wikitext standards. What will be the next level of development for the wiki? While wikis are great for collaborative effort, there is still room for improvement. One feature that is severely lacking is the ability to communicate in real time to others editing the wiki. How will wikis be extended to increase their functionality? New York Times - On profit and wikis. Cnet - On collaborating through wikis. Wikis are the next level of website development. Rather than using HTML which is difficult to learn, wiki websites hosts or wikifarms use wikitext which is much simplier and allow users to accomplish the same thing much more easily. Wikis are easy to use, offer flexibilityand are designed specifically to allow collaboration. A good example of a highly successful wiki is Wikipedia which is the product of many volunteers. Another good example of a wiki is this very report hosted by wikidot. There are a number of ways Vodafone can become part of the wiki creation process. They can provide access to wiki-editing and updates on your mobile phone, provide communication services to other wiki contributors and even provide hosting via companies such as ihug. While being able to edit wikis on your mobile phone is possible, it may not be something that will be viable in the long run as mobile phone screens may be too small for wiki-editing. Due to their usefulness, wikis will continue to develop and expand especially in areas to enhance collaboration.